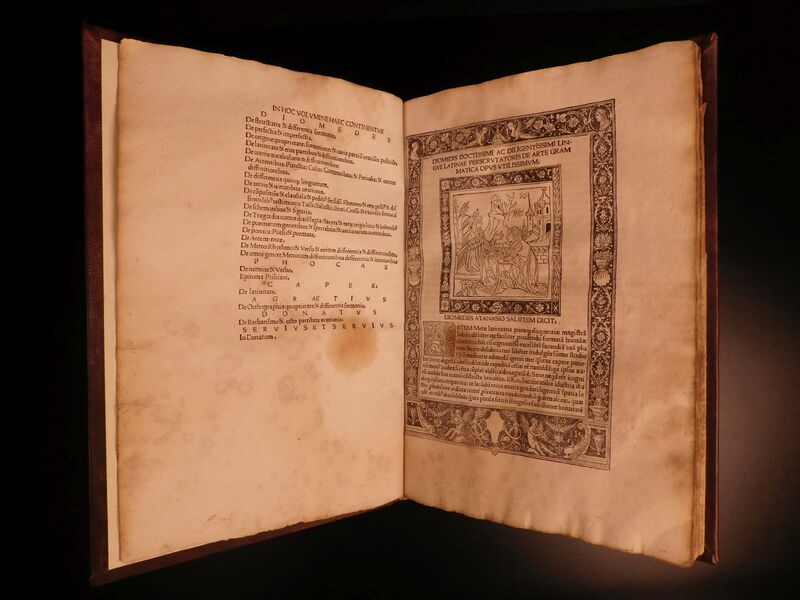 Rare, complete 1491 first edition work of Latin Grammar! Diomedes Grammaticus was a 4th-century Latin grammarian known solely for his grammar treatise – ‘Ars Grammatica’. Latin grammar books were particularly popular throughout the 15th-century, and Italian music publisher Christopher de Pensis capitalized on this surge with ‘Diomedis Doctissimi’, a collection of 2nd to 5th-century Latin grammar and rhetoric treatises. This book included the works of Flavius Caper, Phocas, Agroecius, Aelius Donatus, Maurus Servius Honoratus, and of course Diomedes and was designed for teaching grammar, writing, and public speaking. Diomedis doctissimi ac diligentissimi linguae Latinae perscrutatoris De arte grammatica opus vtilissimum. Impressum per Christophorum de Pensis de mandelo: Venetiis, Die uero. iiii. mensis Iunii, 1491. First edition.